The visitors tried their best but the opponents were too good on the day. 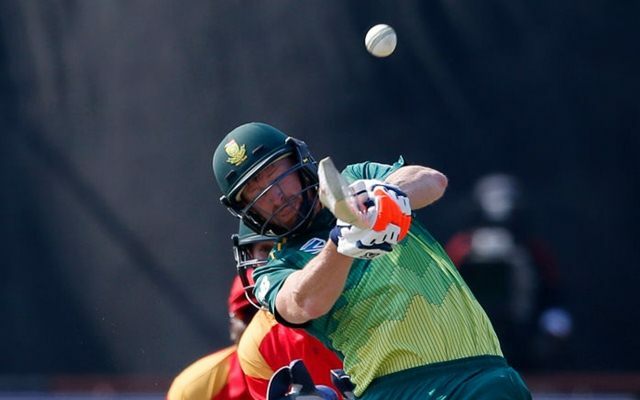 Zimbabwe batted much better compared to their previous outing in the third and final ODI against South Africa. But even that effort wasn’t enough as the hosts cantered to the victory chasing down the total of 229 runs. They have completed a 3-0 series win over the visitors and should be happy as they aimed at giving an opportunity to some of the youngsters keeping the World Cup in mind. Hamilton Masakadza opted to bat first after winning the toss but Soloman Mire’s poor series continued as he failed to cross the double figures yet again. Even Craig Ervine bagged a duck and soon the skipper himself returned to the hut leaving the team reeling at 44/3. Brendan Taylor and Sean Williams rebuilt the innings calmly which worried the Proteas for a moment. Just when it seemed that they were gaining the momentum Imran Tahir fluffed the veteran Taylor who was looking good on 40. Meanwhile, Williams was playing beautifully and notched up his first half-century of the series and was well supported by the lower order. However, his wicket left the innings once again in dire straits. At 182/7, Zimbabwe threatened to implode but Donald Tiripano and Brandon Mavuta to propel the team’s total to 228 runs. Dale Steyn and Kagiso Rabada were superb with the ball for the Proteas and Imran Tahir was at his usual best as he kept on troubling the batsmen. The score was never going to be enough for the visitors to worry their opponents. The opening duo of Aiden Markram and Reeza Hendricks started confidently as they added 75 for the first wicket in the same number of deliveries. Williams pinned the former in front of the stumps Faf du Plessis and JP Duminy were sent back soon. At 122/3, Zimbabwe seemed to have some hope to come back in the game. But Hendricks looked determined to score his first half-century in ODIs. Heinrich Klaasen assured him a decent support. However, after scoring 66 runs, Donald Tiripano pinned him leg before. Klaasen was set until then as he joined hands with Khaya Zondo to take South Africa with utter ease in the end. The hosts reached the target in the 46th over as the wicketkeeper-batsman also smashed a match-winning half-century before getting out with only seven runs needed. This win will make them more happy as it was a clinical effort in all the departments. The action now shifts to the shortest format as the three-match T20I series will commence on October 9.